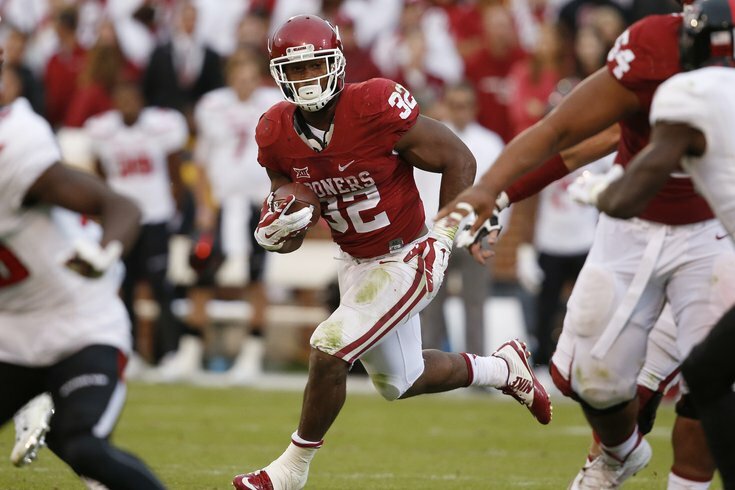 Oklahoma RB Samaje Perine hurts people. Today begins the first full Saturday slate of college football games, and there are a number of good ones to kick off the season. As long as you're taking in some college football today, here are some players who could make some sense for the Eagles in the 2017 NFL Draft. Samaje Perine, RB, Oklahoma (5'10, 235): (3) Oklahoma at (15) Houston, 12:00 p.m.
Perine is probably most known for owning the FBS single-game rushing record, when he had 427 rushing yards in a 2014 game as a freshman against Kansas. He is also known for his incredible strength. Go read what Perine's teammates say about him in the weight room. Here are his numbers. At 5'10, 235, and with his strength noted above, tackling Perine is like tackling a runaway bowling ball. Note the way defenders bounce off of him on initial contact. He reminds me a little of a more jacked up and faster Duce Staley. Over the last two seasons, Perine has just 30 receptions for 215 yards and 1 TD. Doug Pederson likes to use his backs in the passing game, so the Eagles might have to feel comfortable with his hands before they'd invest a high pick on him. Tre'Davious White, CB, LSU (5'11, 191): (5) LSU at Wisconsin, 3:30 p.m.
White wears the prestigious #18 jersey, which is a number awarded to "the team member considered to best exemplify what it means to be an LSU football player, on and off the field." The number was previously worn by Eagles DT Bennie Logan. At 5'11, White is not a tall corner, which is less of a concern under Jim Schwartz than it was under Chip Kelly and the gang. White is an athletic corner with very good change of direction skills who could be a good fit in the Eagles' defense. White also serves as LSU's primary punt returner who has taken a return to the house in each of the last two years. That skill should be attractive to a team that is eventually going to lose Darren Sproles. Elijah Hood, RB, North Carolina (6'0, 220): (18) Georgia at (22) North Carolina, 5:30 p.m.
Like Perine above, Hood is another bigger back who had great numbers in 2015. The downside with Hood, however, is that he does not have breakaway speed, and so far through his career he is not much of a threat out of the backfield as a receiver. Maybe Hood can be a big-bodied banger type to pair with the speedier Wendell Smallwood? Whatever the case, the Eagles are an extremely good bet to draft a running back next year, so we're going to preview a ton of them. Adoree' Jackson, CB/PR/KR/WR, USC (5'11, 185): (20) USC at (1) Alabama, 8:00 p.m.
Adoree' Jackson's position could just be listed as "playmaker," but his primary position in the NFL will be at corner. At USC last year (his sophomore season), in addition to being a regular starter at CB, Jackson caught 27 passes for 414 yards and 2 TDs, he had two punt return TDs, a pick six, and a blocked field goal. In his junior season, scouts will want to see Jackson become a more physical tackler, but he has elite athleticism and could be a first round pick, which the Eagles obviously do not currently have. Should Jackson slide (which is unlikely to happen), think the Eagles might be interested in a CB who can also return kicks and punts? Zach Banner, OT, USC (6'9, 360): (20) USC at (1) Alabama, 8:00 p.m.
At 6'9, 360, Banner is one of the biggest human beings on the planet, and he is athletic for his size. As you might expect of a 360 pound tackle, Banner moves defenders off the ball against their will in the run game, but can struggle with speedier edge rushers. At USC in 2015, Banner started 10 games at RT, and two at LT, so he checks the versatility box to some degree. In the pros, Banner is probably a better fit at RT, which could interest the Eagles as Lane Johnson will eventually take over for Jason Peters long-term at LT, assuming the team hasn't soured on him for his likely second suspension.